Signaling molecules in the Wnt family are some of the most essential messengers for continuous regeneration of our stressed colon mucosa. At the same time, "too much" Wnt is a frequent trigger for colon cancer. Wnt is therefore regarded as an important biomarker and treatment target. The cellular response triggered by Wnt can indicate positive or negative disease progression in colon cancer patients. Scientists from the German Cancer Consortium (DKTK) and Goethe University Frankfurt working at Georg Speyer House demonstrated this in a recent study. The DKTK is a consortium centered around the German Cancer Research Center (DKFZ) in Heidelberg, which has long-term collaborative partnerships with specialist oncological centers at universities across Germany. 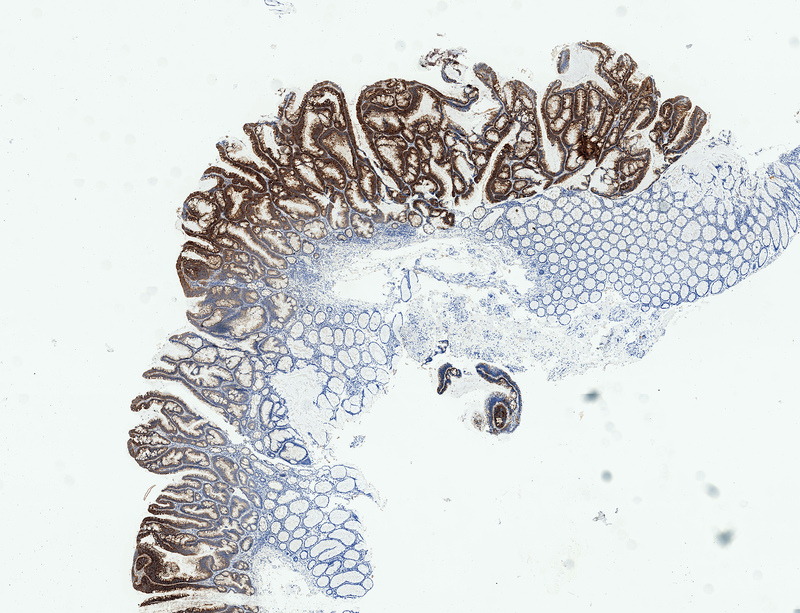 The image shows a human colon polyp with immunohistochemistry staining for DIA2, a biomarker which specifically marks the human adenomas in early stages and adjacent normal tissue. Around 80 percent of all colon tumors involve mutations of the tumor suppressor protein APC (Adenomatous polyposis coli), which leads to an overactive Wnt signaling pathway. Wnt is therefore regarded as one of the most important biomarkers for colon cancer and as a possible target for new colon cancer therapies. "Previous attempts to block the Wnt signaling pathway have failed, however, because of the strong side effects," explains Henner Farin, head of a DKTK young investigator group at Georg Speyer House in Frankfurt. "This is because the Wnt messenger is also essential for stem cell formation and cell division in healthy cells." In this study, Henner Farin and his colleagues discovered for the first time a tumor-specific molecular reaction chain that is triggered by Wnt. The researchers used three-dimensional colon cultures ('organoids') that they had grown from healthy human colon tissue. Organoids represent a new method in biomedical science. Intestinal cells are reproduced as a united cell structure in the laboratory so that they incorporate features similar to the organ they represent and, for example, can be studied to investigate how drugs work in the colon. Using these mini-guts, the researchers were able to compare Wnt activity in colon tumors and in the stem cells from a healthy gut. To do this, they switched off the tumor suppressor protein APC, which caused tumor precursor cells (adenomas) to form. Interestingly, this caused Wnt to activate a completely different palette of genes than in the healthy cells. "Here we see two completely different molecular responses between the healthy cells and the tumor cells," says Henner Farin. "This means that the increased Wnt signal per se is not significant for diagnosis and prognosis. You have to look at the downstream gene expression patterns." The results also explain why until now there have been contradictory reports: sometimes a high Wnt signal is linked to a poor prognosis and sometimes to a good one. The researchers correlated the different expression patterns with the molecular data of large patient cohorts and were then able to identify subtypes with favorable and less favorable disease progression. In addition, the team identified a range of protein markers that could be used to detect tumors in the future. The researchers see great potential in their organoid approach for discovering and targeting new vulnerabilities in tumor cells without harming the healthy cells. "Until now, there were no suitable in vitro models for neatly comparing healthy cells and tumor cells," says Henner Farin. "Patient samples are genetically very variable and there is often no comparison with normal cells. With organoids, we can zoom in on the tumor-specific components in cellular signaling pathways for other types of cancer as well, and discover new cancer-specific vulnerabilities." Use is free of charge. The German Cancer Research Center (Deutsches Krebsforschungszentrum, DKFZ) permits one-time use in the context of reporting about the topic covered in the press release. Images have to be cited as follows: "Source: Henner Farin". The German Cancer Consortium (DKTK) is a joint long-term initiative involving the German Federal Ministry of Education and Research (BMBF), participating German states and the German Cancer Research Center (DKFZ) and was established as one of six German Health Research Centres (DZGs). As DKTK's core center the DKFZ works together with research institutions and hospitals in Berlin, Dresden, Essen/Düsseldorf, Frankfurt/Mainz, Freiburg, Munich, Heidelberg and Tübingen to create the best possible conditions for clinically oriented cancer research. The consortium promotes interdisciplinary research at the interface between basic research and clinical research, as well as clinical trials for innovative treatments and diagnostic methods. Another key focus of the consortium's work is on developing research platforms to speed up the application of personalized cancer treatments and to improve the diagnosis and prevention of cancer.